– “Outstanding in Her field” – a film by and about women in sustainable agriculture produced in the 1990’s by the South Island Organic Producers Association, including Sooke’s Mary Alice Johnson of ALM Farms. This film had the aim “to inspire others to involve themselves in sustainable agriculture on any scale – to join us in this lifestyle that nurtures the ecosystem, our families and our communities and ourselves”. An aim that has been realized in most remarkable ways. 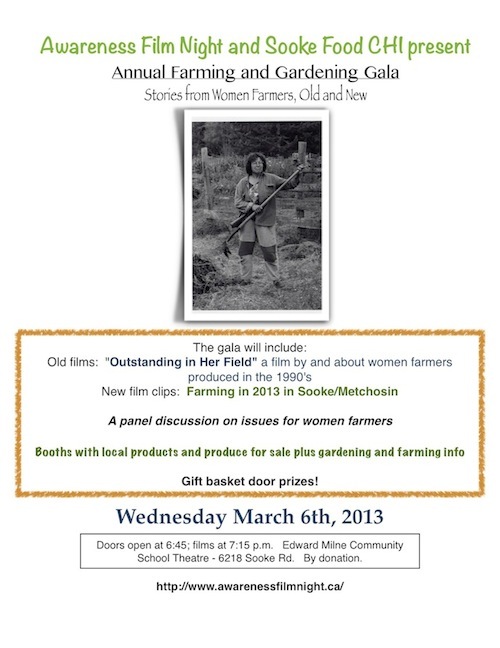 – Several short film clips featuring women farmers in Sooke, East Sooke and Metchosin discussing farming in 2013 as a preview to the planned “Outstanding in Her Field, the Sequel”. – A post screening panel of local farmers will celebrate the experience and unique contributions of women in sustainable agriculture, including such issues as farming with small children, the special roles of husbands of women farmers, access to farm land, the physical demands of farming and exploring why it is that so many new farmers are women. – Booths in the foyer with a wonderful array of locally grown and made products, produce and seeds for sale plus information on gardening and farming in the community. – Tea and goodies (by donation) made by the Culinary Arts students at Edward Milne High School featuring local ingredients. – Gift baskets to give away.